When it comes to layout markup and CSS I use FireBug and the Webdeveloper Toolbar for FireFox constantly. With HTML block alignment a useful tool is the ruler under the Miscellaneous tab in the Webdev Toolbar. The problem with it is this, every page refresh you need to add it back. This is a pain when aligning a lot of different size elements, like forms for example. So I made a simple tool for it, a graphic that is repeated with CSS over the area you are working in or the entire body. A tiny bit of CSS and HTML goes a long way. 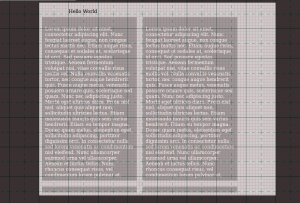 Add the div to the area you want the grid to overlay. Drop the image in an accessible path. Then you should end up with a grid over your layout like this simple example. I will be posting YouTube entries on this also.